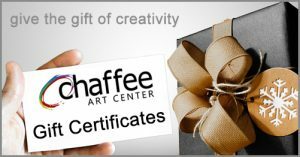 Thank you for supporting the Chaffee Art Center. Your donation helps support continued access to unique educational and cultural opportunities that spark inspiration, creativity, and understanding of the world around us. Through hands-on programs, exhibitions, and special collaborative events…and so much more, together we are building a world-class art, culture and education center for all in our community to experience and enjoy—today and for generations to come.